Thanks for reviewing the book! I enjoyed reading it myself and I think my favorite quote was what you included above about taking time to relax as it truly does make me more productive. Celest, I’m glad you enjoyed reading the book. I know I often find it difficult to relax, but then find I become less and less productive. Natalie, in her article for Forbes suggests setting a timer after 30 min and having a 1 minute break and then after after two hours having a 10-20 minute break. Enjoyed your review of the book. I have heard great things and this review made me want to really read it. Alex, can I please really encourage you to read it. It really is worth reading, there is so much insightful information. As Dean says, this book really can help people move to the next level. It really is worth the time investment and Natalie writes in a style that is very easy to read. Such a great review, very inspirational, thank you! With reviews like this on Best Seller books that will launch someone to the next level, to really embrace so much more there is to life, I feel like the world is my oyster! As always, a very comprehensive and insightful review of Natalie’s book. Thank you!! That is something we all must remember! I responded to Celest below about Natalie’s productivity tips. The Japanese have a saying that “nobody works harder than a man who works for himself.” They also have a work Karōshi (過労死) which means ‘death by overwork.’ It is important to remember sometimes, that we work to live and not live to work. Something that Natalie does so well. 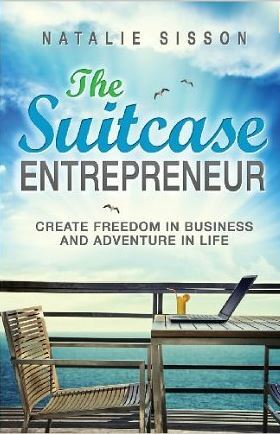 The Suitcase Entrepreneur – what a wild idea, huh? But Natalie breaks it down to be something that can, and SHOULD be done! I love the book, and I really love the review! A wild idea – true, BUT as Natalie outlines a possible idea. I have friends who have done it with children (including one in a wheelchair). I think the example that amazing things are possible helps others to raise their sights. Hope you have some great, wild ideas that will come to fruition too. I am nearly done with this book, and I must say you are spot on with your review. The lessons learned by Natalie will save people so much time and money. Plus, the book is just chock full of resources, helpful websites, and tips that it can almost be seen as more of a Reference book at the library than a step by step. Though, it succeeds at both. Well deserved credit for an excellent book. Thanks Paul. Glad you are finding Natalie’s book useful. There are certainly several resources that I plan to use and techniques I want to implement in my own business. I think what you say about it being a reference book is wise, as instead of finishing it and putting it in the “refinished reading” category and moving on to something else, we would get more out of it if we keep it open as a reference tool. Great post! I’m learning more and more about Natalie each day mostly through various podcasts. Your review is wonderful in shaping the story and getting to the guts of the content. I wish I had 12 hours a day to catch up on some reading but this book is definitely being added to my list. Thanks! Collin, I know what you mean about needing more time to read. I love reading but never seem to have the time. I highly recommend this book when you do have an opportunity. Christine, what a great review! It gave me an urge to read it, many thanks.